H and I thought it bad enough when a portion of the remaining Berlin Wall fell victim to gentrification or the travesty of the massive compound called the Colossus of Prora commissioned as part of the Kraft dürch Freude (Strength through Joy) programme as a seaside retreat and then existed East German secret military base being turned into luxury apartments, and that they were among examples of the worse ways to pave over the past—that is, until learning of this quite tone-deaf property development firm in Hanseatic Hamburg. 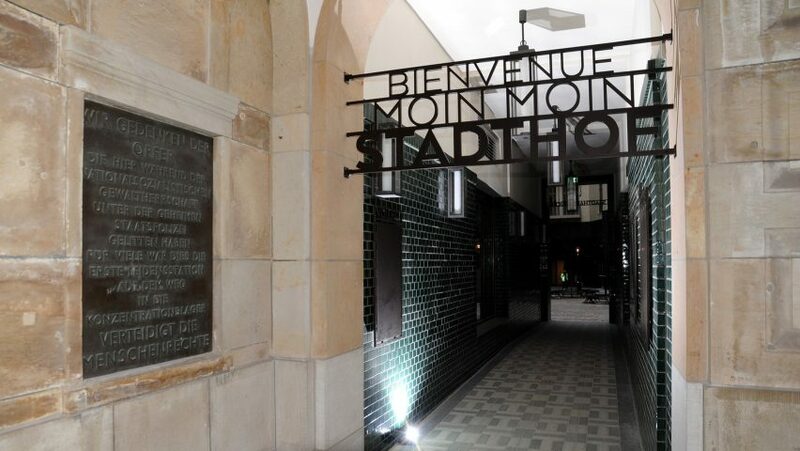 The mixed use residency and deluxe shopping experience refurbishes the Stadthof which once hosted the Gestapos’ regional headquarters and interrogation cells. Originally the layout was to accommodate a museum and memorial to those questioned and disappeared there but the plans were decimated and the monument was reduced to the form of a section in a book shop about Nazi secret police with the possibility of a few plaques. 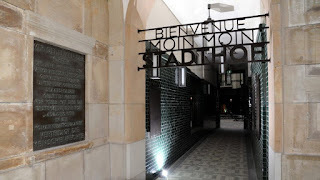 The worse transgression was this wrought iron entry way (next to a table giving the history of the compound) that evokes the look of the lettering dismissive, dehumanising gates of concentration camps and juxtaposed with such a twee and trite message of welcome seems not only wilfully ignorant but an insult to what happened here.